NOTES: One major brain fart. 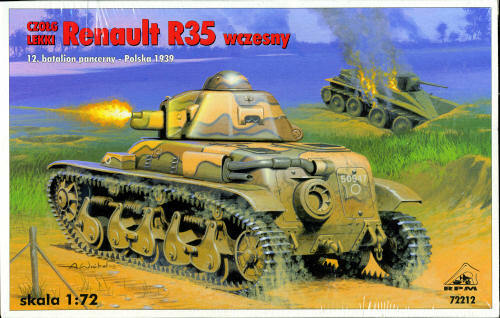 When developing the R 35, to save time, Renault based the suspension and running gear on that of the AMR 35 (Automitrailleuse de Reconnaissance Modèle 1935 Renault ZT) that was designed for the cavalry. It had five wheels at each side, fitted with horizontal leaf springs, like the AMC 35. The hull, with a length of 4.02 m, consisted of three cast modules, with a maximum thickness of 43 millimetres, that were bolted together. Total weight was 10.6 metric tonnes (9.8 tonnes without oil and ammunition). The bottom module carried on each side an independently sprung front wheel, two bogies and the driving sprocket at the extreme front. The final drive and differentials were housed at the right in the nose module. It was steered through a Cletrac differential with five gears and by engaging the brakes. The driver was seated somewhat to the left and had two hatches. The Renault V-4 85 hp engine was to the right in the short rear with the self sealing 166 litre fuel tank at its left. It rendered a road speed of 20 km/h and a range of 130 km. Cross-country speed did not exceed 14 km/h and the fuel consumption totalled 212 L/100 km. From 1940 onward they were fitted with AMX tails to help in trench crossing. The cast APX hexagonal turret had a 30 mm thick domed rotatable cupola with vertical vision slits (the highest point of 2.13 m) and had to be either hand cranked or moved about by the weight of the commander, the only other crew member. There was sometimes unofficially a seat installed for him but he most often stood. The rear of the turret had a hatch that hinged down and would be used as a seat to improve observation. The earliest vehicles were fitted with the APX-R turret (with the L713 sight) mounting the short Puteaux 37 mm L/21 SA18 gun (the first batches removed from the FT 17 guntanks which were then rebuilt as utility vehicles) and the 7.5 mm Châtellerault fortress machine gun. The cannon had a very poor armour penetration: only 12 mm at 500 metres. Afterwards the APX turret with the same cannon but the improved L739 sight and the standard Châtellerault 7.5 mm MAC31 "Reibel" machine gun was used because of delivery delays for the original weapon. There were so many delays in the production of the turrets also that after the first 380 hulls had been produced in 1936 and only 37 could be fitted with a turret, production was slowed down to 200 annually. The 7.5 mm machine gun's spent cartridges (from a total of 2400) went down a chute through a hole in the floor. The tank carried 42 AP and 58 HE-rounds. The R 35 at first had no radio, except for the second battalion of the 507e Régiment de Chars de Combat (of Charles de Gaulle), but the R 40 had the ER 54 installed. However, this added to the already heavy task load of the commander, who also acted as gunner and loader. It has been a long time since I've seen a kit molded in silver plastic, but here it is. RPM's kit comes molded on one full-size and one smaller sprue. These rattle around in a box that is considerably larger than needs be, but apparently RPM, like most companies, has a standard size container for kits of this size. The molding is fairly well done, though there is some small amount of flash on nearly all the small parts that will require time to clean up. I also found sink areas on some of the thicker bits, though it seems that most of these will be covered over when construction is complete. Perhaps the most glaring glitch is that the outer track face is almost totally smooth. Yet the inside of the track is fully detailed. Just how this came to be is a real mystery and few modelers that I know are going to be willing to glue on strips of styrene to simulate the treads. Getting past that, the kit itself is fairly well done with a motor that is cemented on the interior floor and a transmission section as well. By no means a full interior, but better than nothing, especially if you wish to leave a hatch or two open. Otherwise, if you build it buttoned up, I'd leave out all the interior pieces. The main gun is built up out of several very small pieces and will also need to have the barrel end sanded flat and drilled out. There are a considerable number of exterior bits like tow rings, shovels, spare wheels and other somewhat small pieces. Instructions are well drawn and consist of 22 construction steps. No interior color information is supplied. All of the construction information and history is in Polish. There are markings for 14 vehicles, some differing only by serial number. They are painted in one of two methods. One is a disruptive camouflage and the other an overall greenish shade. I have to assume the color information supplied is in Humbrol references as there is nothing but an H- number given. The back of the box has full color painting information and artwork. On the side of the box are small photos of a preserved tank. 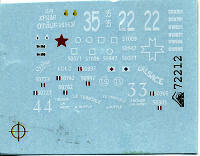 The small decal sheet is well printed with very large carrier over each marking. So much so that it often blends into the marking next to it so will have to be cut out individually. I'm not sure how opaque these will be. The scan of the sheet has been darkened to make the white markings more visible. I This is a kit that while inexpensive, is still not that much less so than a full blown Dragon kit. What will bring buyers to this one is the subject as I can't think of any other injection molded R35 with this level of detail. What will keep most from buying another is the flash on all the parts, light though it may be, and the really horrific goof regarding the treads. Thanks to me and my hopes for a nice kit of an interesting tank for this one.